Anyone in a position of leadership would benefit from the training provided by these course materials. If someone has to harness the skills and energy of other people to achieve a common goal then this course is for them. The leadership skills training course materials will benefit participants that need to enhance or develop their leadership skills. They will suit people that are relatively new to leadership or are in need of a fresh perspective to their leadership role. 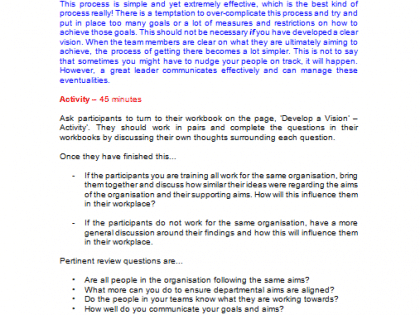 The content is a perfect follow-up to our nuts and bolts leadership course, ‘Leading Effective Teams’ although they can be used as a standalone too. Organisations need great leaders. Here you have the training course materials to help find them. Modern leadership is about having the skills to unlock the power and potential of those around you. It’s about bringing people together to achieve great results. This leadership skills training course gives you all the tools and expert knowledge to run a professional and effective workshop on leadership. Perhaps you’re looking to improve the performance of a management or leadership team. 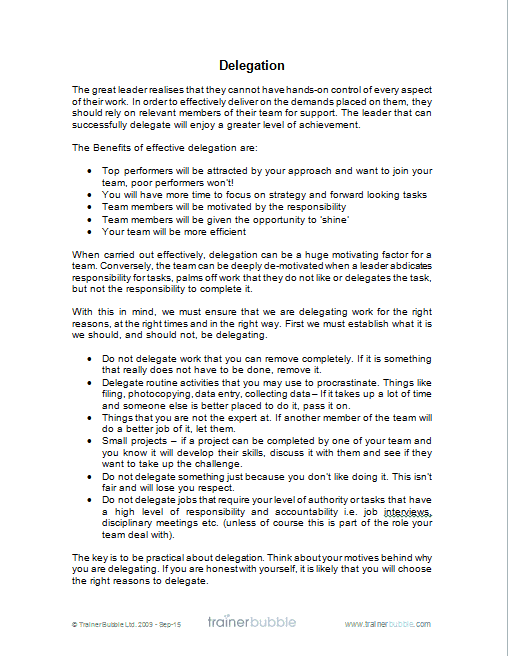 Or you want to include leadership training as part of management and supervisor induction sessions. Whatever your need, Trainer Bubble provides you with a comprehensive leadership training course to make your life easy. 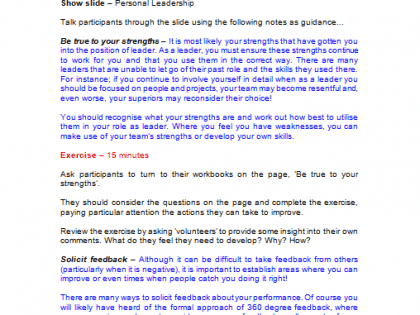 Why is running this leadership course a good idea? Inspire their teams, bringing out the best in each and every individual. Overcome commercial challenges by getting everyone working together. Unite individuals around a common vision, always building a consensus for change. Create a positive work environment by respecting and valuing everyone. Improve their self-awareness making them better, more productive leaders. 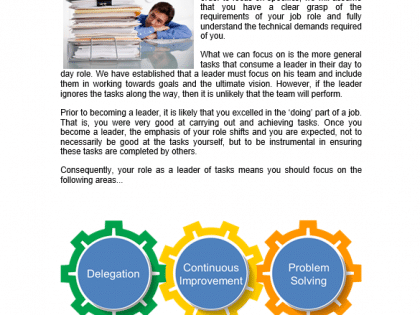 Simply get the job done quickly and efficiently, for overall organisational success. Keep their teams happy and reduce staff turnaround. 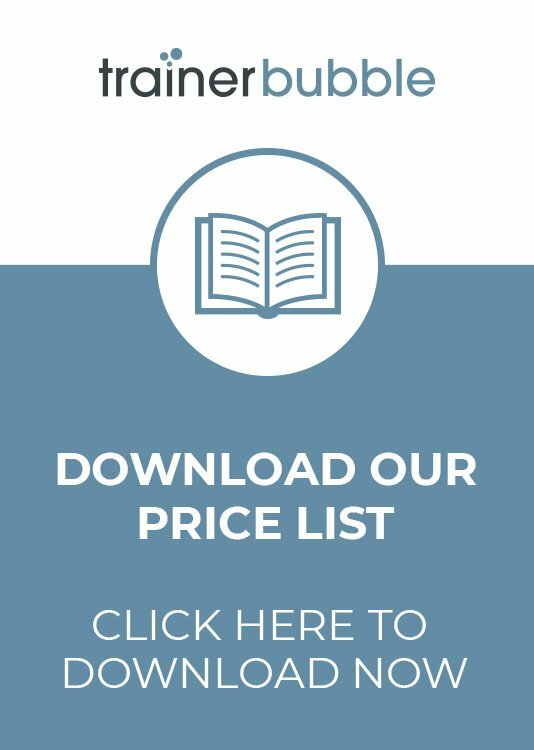 Ultimately these training course materials allow you to nurture a workforce that is more motivated, inspired and productive. You need great leaders. And now you have the great training course materials to help you get them. 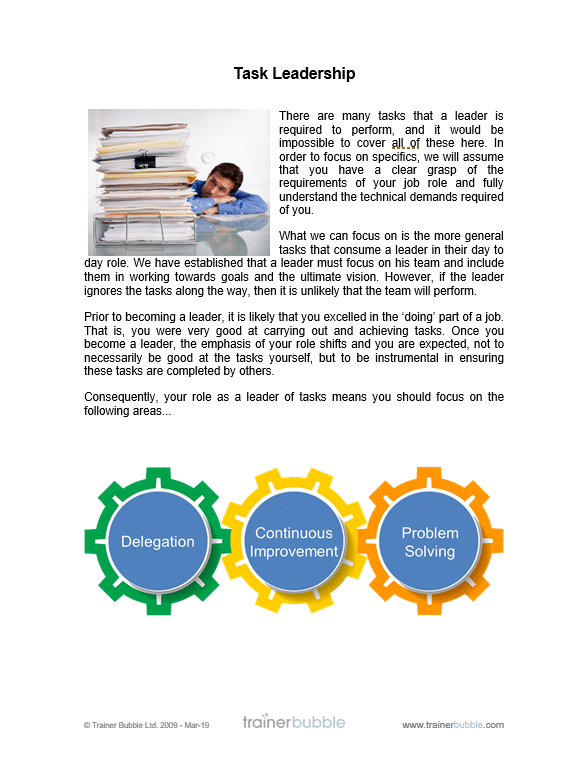 These leadership skills training course materials will provide the basis on which your participants can cultivate great leadership skills. There are three elements of leadership that the training will focus on, these are: Personal Leadership, Team Leadership and Task Leadership. Icebreaker – Leadership Words – Helping participants to focus on the relevant attributes of a leader and explore their own views towards leadership. – Be True to Your Strengths – A self review of personal attributes and their current effectiveness and personal actions to develop. – Solicit Feedback – Understanding working relationships and reviewing which interactions are working and those that are not. – Ask Good Questions and Listen to the Responses – Challenging the participants to take positive measures to become truly self-aware. – Commit to Lifelong Learning – Identifying valuable methods of learning and development. – Be Positive – Developing a fundamental belief that you can change and improve things. 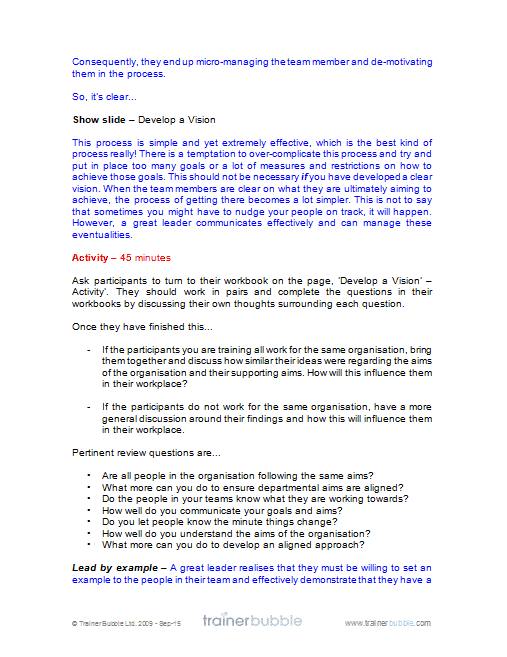 – Develop a Vision – Using a clear process for developing goals and aims that are directly related to the vision of the organisation and making them live for the team. – Lead by Example – Realising that they must set an example to the team and effectively demonstrate they have a strong work ethic. – Be Inclusive – Taking a questionnaire to establish their current approach to inclusiveness. Developing a sensible approach to transformational leadership and valuing the input of the team. 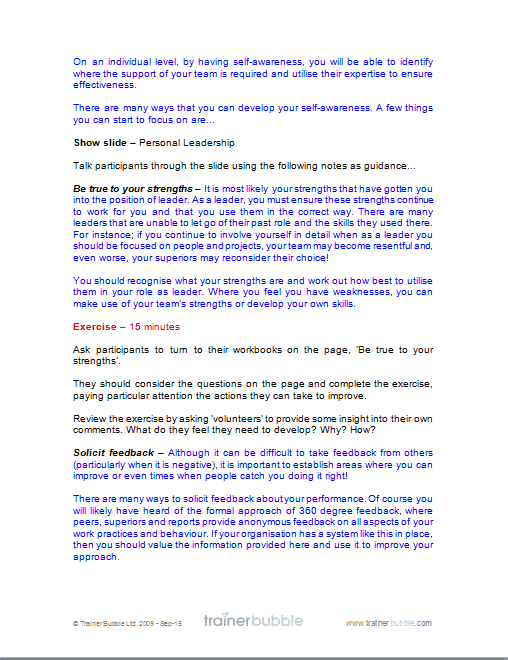 – Manage Negativity – Exploring the impact of negativity and establishing methods of overcoming it. 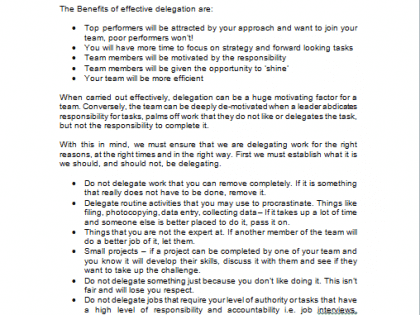 – Delegation – Distributing relevant work tasks in such a way that it is seen as motivational and effective. Following a clear and simple process. – Continuous Improvement – Identifying new opportunities. Regularly reviewing business processes and methods in the drive for improvement. – Problem Solving – Coping with problems as they arise and using a simple method to explore innovative ideas and come to a reasoned solution. As with all Trainer Bubble products, this training course is interactive and full of relevant activities.